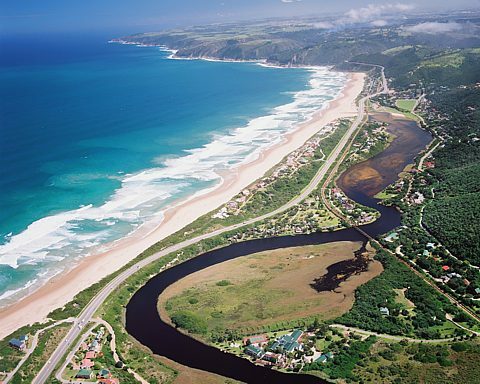 Wilderness central to the South Africa Garden Route is 15km east of George and is home to the Wilderness National Park, a rare aquatic eco system that includes rivers, lakes, estuaries and 18km of coastline. The almost all year summer weather makes Wilderness one of the Garden Route and South Africa's most popular holiday and tourist destinations. 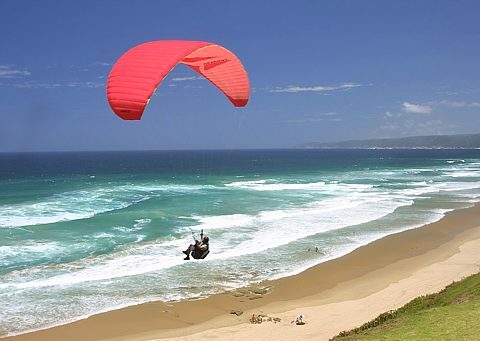 The summer weather, pristine white beaches and amazing panoramic views along the Garden Route coastline provide make Wilderness one of the most popular paragliding spots in South Africa. It is a bird-lover’s paradise with more than 262 bird species recorded in the Park. As far back as the late 1800's the reputation of Wilderness with its natural bounty of rivers and lakes and intrinsic peace and tranquillity, ideal for seaside holidays, was established in a little stone farmhouse. A seaside boarding house was established in the old homestead - and so began the tradition of hospitality which has made this small resort famous all over the world. The farmhouse is now part of the Karos Wilderness Hotel, previously known as the Wilderness Hotel, which was rebuilt and expanded after it was almost completely destroyed by fire in 1985. Village life can be enjoyed to the full in this peaceful haven surrounded by sea, lakes, lagoons, rivers and pristine forest. The ‘eternal spring’ weather creates an outdoor style of living that draws locals and visitors alike to the long stretches of sandy white beach throughout the year. There are several restaurants, craft stalls, shops and art galleries as well as a variety of accommodation set on the beach and in the forest. It’s a veritable ‘beach to bush’ destination. Wander through the quiet forest where giant ‘yellowwood trees rise like giants towards the skyline and where a tine duiker or a bushbuck may skip across your path, or catch a glimpse of the Malachite Kingfisher and the elusive Loerie, from one of many bird hides dotted in the forest and along the rivers and lakes. You may even catch a rare glimpse of a leopard as it crawls silently on velvety paws through the shadowy forest…. 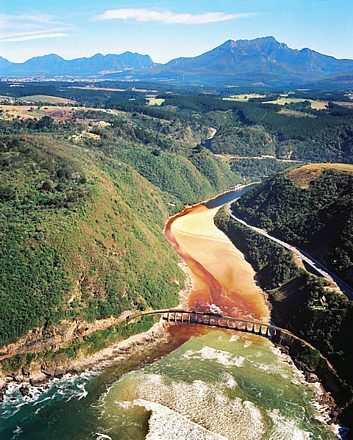 Wilderness lies between the Kaaimans River in the West and the Goukamma Nature Reserve in the east, bordered by the Outeniqua Mountains in the north and the Indian Ocean in the south. Wilderness is renowned for its vast stretches of beach, its peace and tranquillity and the absence of windswept headlands and wild, stormy seas. The long stretch of beach embraces the mouths of the Touw and Kaaimans Rivers, and is backed by northward cliffs over which the fringe of the forest reaches down to sea level. Wilderness not only overlooks the sea, but also the placid lagoon (Touw River Estuary), the Serpentine, which meanders between the Touw River, Island Lake and Rondevlei. This is a favourite venue for waterskiing and attracts enthusiasts from far and wide. Recreation includes hiking, mountain-biking, bird- and whale-watching, hang- and paragliding, horseriding, scenic drives, day tours, angling, boating and other water sports. By way of accommodation, there is something for everyone - hotels, guest houses, B & B and self-catering establishments. Excellent viewpoints are Map of Africa with breathtaking scenery of forests, lakes, mountains and coastline and Dolphin's Point, an excellent vantage point from which to study whales and dolphins. 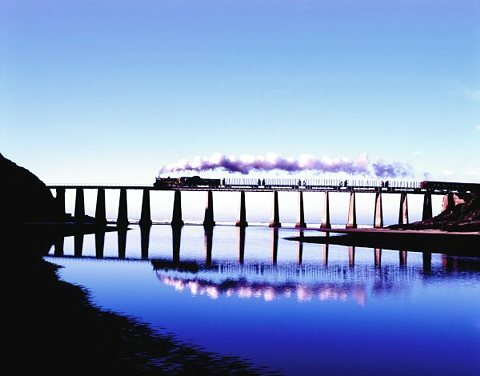 Kaaimans River Bridge is a much favoured spot for photography. Woodville Big Tree, over 800 years old, creates shaded areas with its massive branches, making it a great picnic spot. Take a stroll along The boardwalk (also wheelchair-friendly) which is part of the Pied Kingfisher Trail and home to a wide variety of birds. The winter climate is splendid with sunshine days and temperatures that rarely drop below 8 degrees celcius. The annual rainfall averages around 700mm. Paragliding, mountain biking, waterskiing, abseiling, canoeing trails. Horse-riding through forests, on farms and along country roads. Beaches are ideal for fishing, sunbathing and water sport activities. Langvlei, Rondevlei and Touw River are excellent for birding (bird-hides). The Wilderness National Park, with a lake area of 10 000ha – Kingfisher Hiking Trail. Dolphin Point offers coastal views, with dolphin and whale-watching between July and October. Visit Timberlake for organic food, wine and arts and crafts.